Fifty years ago I was sixteen years old and not happy. I was an overweight introvert who wanted to be someone else. One of my heroes—my only hero, really—had just been murdered less than three months before. I felt that the entire world was gray, colorless. I watched that Ed Sullivan show on the black and white portable television my sister and I received the previous Christmas. I think we got the TV because my parents were concerned about my reaction to President Kennedy’s assassination. And I think they were glad to get me and my sister out of the living room in the evening. From the moment I saw them I was hooked—in love with all four (but especially Paul) and the upbeat, happy music. Upbeat, happy. That was something different. Over the next few years—through high school and nursing school—I saw three concerts in person. My father was not the most giving person but he did drive me to the first one at the Baltimore Civic Center. I wore a black suit and heels. Well, it was 1964. That was a big deal for Pop—he was a barber and frequently said they would destroy his business. Pop also gave me $25 to buy a ticket for a bus trip to their Shea Stadium concert. The last concert I saw was in RFK Stadium in Washington, D.C. I even skipped school (something I never did) and took a bus into Washington to the opening of their second movie. I’d sat through the first one about ten times in several viewings. I used babysitting money to buy their records. I had trading cards, magazines and posters. I guess you can say I was/am a fan. After 1980 (another hero murdered) I began to make a trip to Strawberry Fields in Central Park every December 8th. Some years my daughter would go with me. We were there, with hundreds maybe thousands of others, at the twenty-fifth anniversary of that dreadful day. But when I remember the first day, fifty years ago, I know upbeat and happy are the right words. So easy to understand. 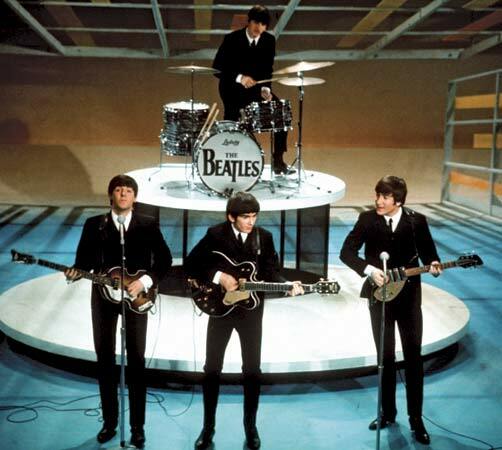 My parents would never have let me attend a concert, but seeing the Beatlers for the first time on Ed Sullivan changed my life, too. I can still sing along with every word, every note and, you must know how it feels, I’m 16-21 again. We had a wonderful opportunity to see the world change, didn’t we? Yes, we did, Irene. I miss that feeling sometimes. I did get it back when Obama was elected…things changing.